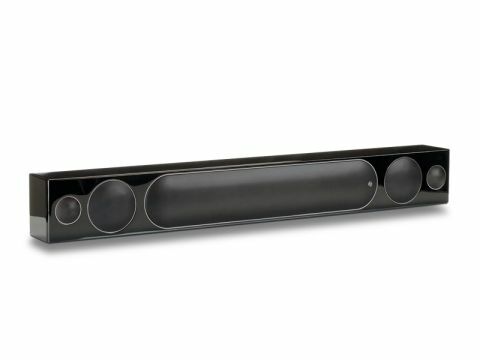 Monitor Audio's debut soundbar differs from the rest in that it's not designed to replace a 5.1-system, but to form part of one. Inside this sleek, compact unit are left, right and centre speaker drivers, but no rear ones, sub or pseudo surround sound processing. To complete the setup you can buy other Radius speakers separately, including R45HD rears and the R360HD sub, but that sort of defeats the object. The other difference is that it's not powered and features no built-in decoding, which means you'll need a separate AV receiver to prepare the sound before piping it to this unit with speaker cables. It's best to think of it as front and centre speakers wrapped up in a single unit, rather than a fully-fledged one-box system. The luxurious styling comes in piano black lacquer, silver or white finishes with slightly protruding speaker grilles, all of which looks gorgeous when attached to the wall using the supplied die-cast metal bracket. Build quality is sublime, too, epitomised by the three pairs of robust binding posts on the back. The unit is over a metre wide, but it can be mounted vertically. Each of the three channels inside has a dedicated braced compartment, which keeps unwanted interference at bay, plus each one is magnetically shielded and has its own crossover. The centre channel uses twin MMP II mid/bass drivers and a 1in C-CAM gold dome tweeter capable of reaching frequencies over 35kHz – ideal for Blu-ray soundtracks – while the front channels use a single MMP II driver with a C-CAM tweeter. Among the other technological innovations on board is an Anti-Resonance Composite baffle that reduces bothersome vibrations and a PTC auto-reset protection circuit that kicks in when the speakers are being over-driven to protect them. The sound is simply fantastic, packed with plenty of detail and delivered with a smooth neutral tone that works well for movies and music alike. Because it's passive and unrestrained by connections or audio formats, the Radius One HD will play whatever you feed into it, and the hi-res Dolby True HD soundtrack of I Am Legend on Blu-ray sounds stunning. High-frequency sounds are relayed with control and insight, not once sounding hard or bright. It's also able to eke out subtle background detail with total ease. We also admired its natural bass handling, even without adding the Radius 360 HD subwoofer (a £400 option). It does a great job with low frequency effects, making loud thumps and explosions sound taut and controlled, but it doesn't plumb the same depths as the dedicated subs inside other high-end soundbars. Dialogue is forthright and full-bodied, making every word clear and intelligible even during the most complex action scenes. The lack of any virtual surround processing or EQ modes means there's very little width – the sound here is direct and focused, which many might see as a good thing. But inevitably when listening to Radius One HD on its own, it does feel lacking. It's designed to be teamed up with other speakers in the Radius range, which bumps up the cost and means you'll have to hook everything up with cables – the very thing soundbars are normally designed to avoid. It's not a criticism as such, it just means that the Radius One HD isn't aimed at your typical soundbar buyer.